I was recently given the delightful task of reviewing Red Branch Publications’ Cascade. It is an old school horror story that involves a Native America curse a young couple and a redneck ex-boyfriend. That’s really just the tip of the iceberg for this story but I do not want to spoil anything for potential readers. You can pick the two issue story arc up here for only 3 dollars if you want to read it and come back to read this review. Now before I jump into the nuts and bolts of this macabre tale of family ties and death I’m going to give this final warning SPOILERS ahead. The story starts pleasantly enough with young couple Sue and Mark eating breakfast. Sue then breaks the life changing news that she is pregnant. This causes a chain reaction that sets Mark on the path to meeting Sue’s estranged parents. The journey is plagued with storms and an ex-boyfriend who works at a gas station. The ex-boyfriend rigs their car to break down in order to overcharge them to fix it, which is sadly a fairly accurate portrayal of small town mechanics. Things just get worse for the couple from there on. They find Sue’s family home haunted, fairly literally. The twist comes when it is revealed that Sue was the one who killed her own family as she turns on both her ex-boyfriend and the current father of her child. Plenty of death ensues in the final act as Sue leaves the area with her doll who she grew attached to while stuck in the attic by her parents long ago. It was there she got the idea to murder them all in the first place. It is an entertaining read with some interesting themes. The biggest of which is family. Sue and Mark are about to start their own new family so they decided to visit Sue’s old family. On the way Mark learns Sue is a member of the Daniels family. They have lived in virtually the same place for over 300 years and had a curse placed on them when they drowned a young Native American for romancing one of their own. The fact that the curse is obviously still going strong on the Daniels family so long after those that perpetrated the actual crime against the Native American raises some interesting questions. Primarily, should people in the present be punished for the sins of their ancestors? Are modern day Germans accountable for the Nazis? Are modern Americans accountable for Slavery? In my mind the answer is absolutely not. So then it makes the idea of a curse that sticks with a family for so long seem tragically unfair. The idea of a curse on a whole blood line seems to be a sort of like a remnant of old fashioned aristocratic European thinking. Keeping a blood line strong and hardy was the most important thing to many European families in order to maintain their property and wealth. So it’s only natural that a curse that affected their bloodline was one of their worst fears. It has also been reflected in mythology and fiction for hundreds of years. Fall of the House of Usher by Edgar Allan Poe is the most prevalent example that comes to my mind. One of the closest things the American continent has had to European aristocrats was Southern Aristocrats. So naturally the Daniels family seems to be an old fashioned Southern family. The next big theme I picked up on was a sort of feminism gone wrong. Sue is treated horribly by her patriarchal and old fashioned family. They lock her in an attic when she announces she has a boyfriend and would like to go to college. Years later she has locked away the memory of murdering her family until her boyfriend starts to treat her like a woman that needs protection. Once he begins to nurture her and tell her he will take care of her and their child the killer instinct seems to begin awakening in her. Seeing her old doll which was also locked in the attic with her at one time, and is also a girl fully reminds her of the murderer she once was. So it is that as she kills her boyfriend she monologues about how his sudden change into a patriarch was why she had to be free of what she saw as a reminder of her father and grand-father’s oppressive nature. Thus it is that her nature of wanting to be free and independent of a male overlord sort of causes her murders. That said she is also just insane and I’m not saying feminism is bad. It’s a good thing but like anything it can be taken too far and when someone kills just to avoid being dependent on a man, well that’s when you know it has gone too far. Lastly I will turn my attention to the two classic horror beats this story concerns itself with. The first is the idea of the big city / eastern man going to the small town. I’m not sure when this became such a prevalent concern of horror stories. Perhaps it is the idea of going from a place of civilization to an area of isolation? That said Mark the ‘big city’ man doesn’t believe in ghosts and doesn’t believe in curses at the start of the story only to have his mind changed by the end of it. The second classic horror beat is the idea of the Native American curse. This is a pretty easy thing to explain. The United States effectively destroyed the Native Americans control of America. The idea of Native American curses must have sprung up as a sort of fearful reaction to them taking vengeance on those who took their land and as a sort of guilt over the countries atrocious actions. 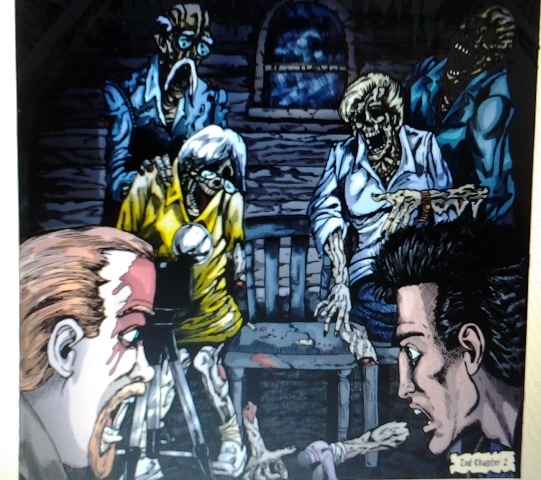 Chris Canibano has penned a rich and well thought out comic book. He especially succeeds at creating an atmosphere of impending doom early on in the comic. While reading comics on computers can sometimes be a bit of a pain I had no problems reading Cascade and actually couldn’t stop myself from flying through the story. Larry Nadolsky’s art style lends itself extremely well to horror and only helps to strengthen the already solid title. The story has a definite ending but at the same time leaves things open that I wouldn’t mind seeing explored in the future. I recommend giving it a read for yourself if you like horror. Check it out here at DriveThruComics, like I said for the price of 3 dollars you really can’t go wrong. See you next ‘Thor’s Day’ for another Comic Book Commentary!